The information on the picture says it was a wedding picture taken in 1912. However, Julia and Rast's marriage license was issued on 12 June 1913 so the information written on the picture is probably in error. 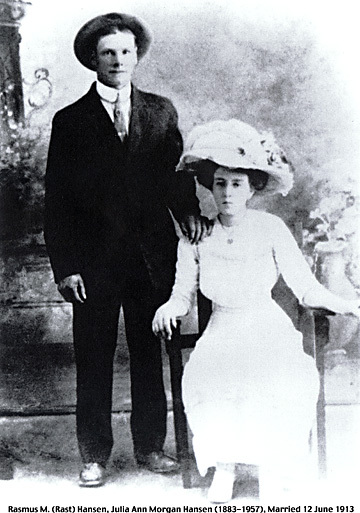 The Ancestral File gives their marriage date as 12 June 1913 so they either got married the day the marriage license was issued or shortly thereafter. Julia Ann Morgan Hansen was born 11 January 1883 in Neeley, Idaho. She married Rasmus Hansen 12 June 1913. She died 28 January 1957. (1) (Oeta?) Ila Fern Hansen, born Dec 4, 1914 in Neeley (American Falls), Idaho, married Leslie Nowland in 1932. Died 26 Nov 2003. She is buried in the Cloverdale Boise Idaho cemetery. (2) Lovina (Vina) Gunalda Hansen, born 4 Dec 1917 in American Falls, Idaho, Married Ralph Kindall, Died 24 March 1946. She is buried in Meridian Idaho cemetery. (3) Helen Hansen, born 6 July 1919, in American Falls, Idaho, Married Kenneth Moran in her first marriage and Earl W Prescott in her second marriage 3 July 1959. Her name is on the headstone with Earl Prescott in the Meridian Idaho cemetery but no death date is listed which makes us wonder if she is buried there. 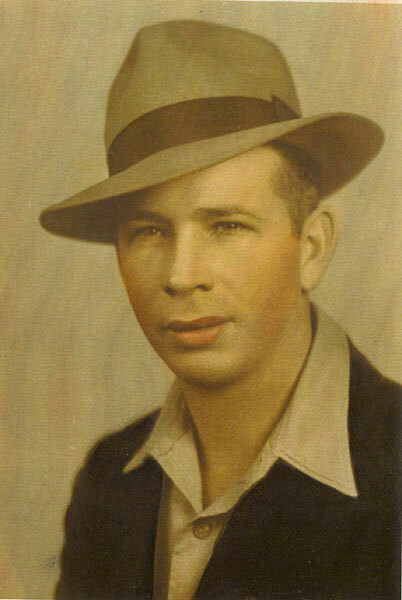 (4) Melvin R. Hansen, born either 4-20-1922 or 20 August 1922 at American Falls, Idaho, Died 10 January 1968. Buried in the Meridian Idaho cemetery. Never married according to the record I have. Rasmus (Rast) Hansen was born 5 Dec 1882 in Smithfield., Cache, Utah and died 11 Sept 1960. This photograph of Rast and Julia Morgan Hansen was clearly taken at the same time and place as the one at the top of the page. It appears that two poses were made, one standing without hats, and one sitting with hats. Earlier we had thought the pictures were taken at different times and places. But when we obtained better copies of the pictures it was clear that they were both taken at the same time and place. In a short life history sketch written by Julia Morgan Hansen she states the following about her mother, Lovina Ross Holden Morgan: "She was married previously to being married to my father to a Mr. Holden. She never talked of this marriage so I know only that she had one daughter Sarah Jane, born 21st of June 1879 Lemington, Millard Co. Utah." The older daughter Sarah Jane was born to Lovina Ross and John Holden before Lovina married William Morgan. We have not been able to find any records confirming this marriage but the family histories handed down all mention it. William and Lovina did raise Sarah Jane as one of their own. Julia goes on to say that her parents (Wiliam and Lovina Morgan) came to American Falls, Idaho in 1880 where 6 families filed on 60 acres of land each 4 1/2 miles West of American Falls. She states that they came from Utah in covered wagons, that many of their livestock died that first winter but because of the provisions they brought with them no one was ever hungry. She notes that their first home was a dugout, a cellar with dirt floor and a bank left higher on the sides for beds. And goes on to say that in spring they managed to get some logs from the canyon and "Father built a one room house." She notes that the following winter Diptheria came and one family lost 3 children. There are errors in this account. William and Lovina came to Idaho in the fall of 1881, they may have lived in the dugouts for two winters before they got houses built, and homesteads in those days were usually larger than 60 acres. Julia was not born until 1883 so she would not have experienced the move to Idaho and must have learned about it second hand. But hers is still an interesting account of the move to Idaho. 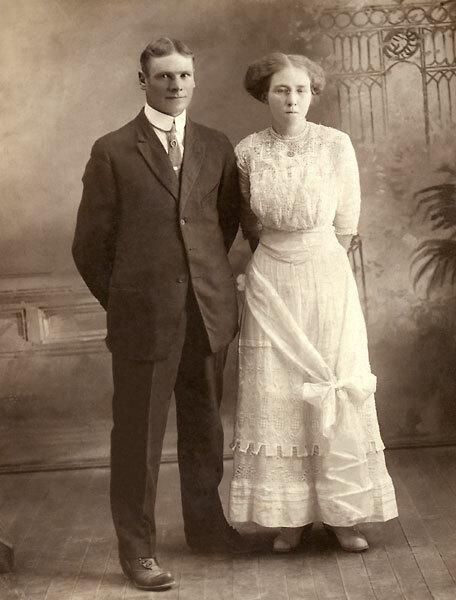 Rast and Julia Hansen were listed in the 1930 census as living in Meridian, Idaho, near Boise, Idaho. They made their home at Meridian, Idaho until their deaths. Julia Ann Morgan Hansen died at Meridian, Ada County, Idaho 28 January, 1957. Rasmum M. Hansen died 11 September 1960 at Boise, Ada, Idaho. Click on the link above to see a collection of Julia and Rast Hansen family pictures. Click on the link above to see an obituary for Rast Hansen. Click on the link above to see a nice portrait of Julia and her sister Ada when they were young girls. The picture is at the bottom of the page.